Due to rapidly evolving digital technologies and new business opportunities, the digital economy is growing rapidly, but unevenly. Despite some confusion due to marketing hype (1) , new ITU estimates suggest that by the end of 2018, we will surpass the 50/50 milestone for Internet use. * Viewpoint 1 describes how access to broadband infrastructure can be extended to create an inclusive Information Society. At the same time, strong inequalities between countries persist in terms of speed of access (Figure 2), as well as differences in how connectivity is used (Viewpoint 2). Figure 2 shows average global connection speeds in early 2018, with significant differences in speed observed between the fastest regions (in North America and northern Europe) and regions with lower average connection speeds (Africa, and some countries in Latin America and Asia). Seven out of the top ten largest companies by capitalization in the world in Q3 2017 are digital companies with a strong digital component to their business (2). GSMA = GSMA database; MAU = monthly active users; DAU = daily active users. In addition to infrastructure and basic access, growth in data must also be considered. Estimates of data growth are generally difficult to come by, but Cisco estimates that traffic over the Internet will grow by over 20% a year between 2015-2020 (9) , and that by 2021, global IP traffic will reach an annual run rate of 3.3 zettabytes. Cisco also projects that, by 2021, 80% of all Internet traffic will be video, up from 67% in 2016. OTT applications such as YouTube and Netflix are contributing to this growth in data flows and Internet traffic, with strong growth in subscriber and user numbers for several key services (Figure 3). In terms of subscriber numbers, WhatsApp (owned by Facebook) now offers messaging and calling services to some 1.5 billion users in over 180 countries (10). Viber (owned by Rakuten) currently offers calling, video and messaging services to over 800 million people (11). Facebook lists some 2.2 billion monthly active users (MAU) on Facebook for Q1 2018, a 13% increase year-on-year. Some 1.45 billion people on average log onto Facebook daily as Daily Active Users (DAU) for March 2018, matching the growth in MAU with a 13% increase year-on-year. However, DAU and MAU are not measures of data traffic, and use of Facebook varies considerably in different regions of the world. According to some estimates, some 2.5 quintillion bytes of information are generated daily, while Google alone is estimated to store over ten Exabytes of data on a daily basis (12). 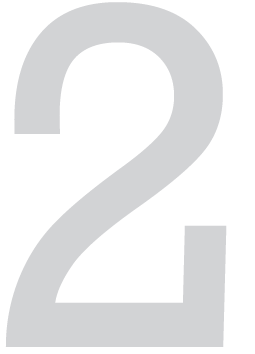 IDC/EMC (2014) reported that “the digital universe is doubling in size every two years and will multiply ten-fold between 2013 and 2020” (13). More recent IDC estimates put the size of the digital universe at around 2.7 Zettabytes of data, but that by 2020, 30 Zettabytes of data will be generated annually. However, there are some indications that inequalities in access to and use of intelligent connectivity may be growing (Viewpoint 2). Strong growth in mobile broadband subscriber numbers continues, driven in part by consumer demand for applications. Point Topic reports that fixed wireless technologies are increasingly giving way to 4G LTE-based mobile broadband access, with 4G LTE now a major means of getting broadband at home in several regions – for example, Scandinavia and Eastern Europe (14). The Inclusive Internet Index (3i) (15), commissioned by Facebook and the Economist Intelligence Unit, shows that access to 4G networking services improved over the last year, particularly in low-income countries where coverage almost doubled, from 9.1% to 17.3%. ITU’s Global ICT Development Index shows generally broad growth in ICT readiness, use and impact. Figure 4 shows the number of subscribers globally, by generation of mobile technology. 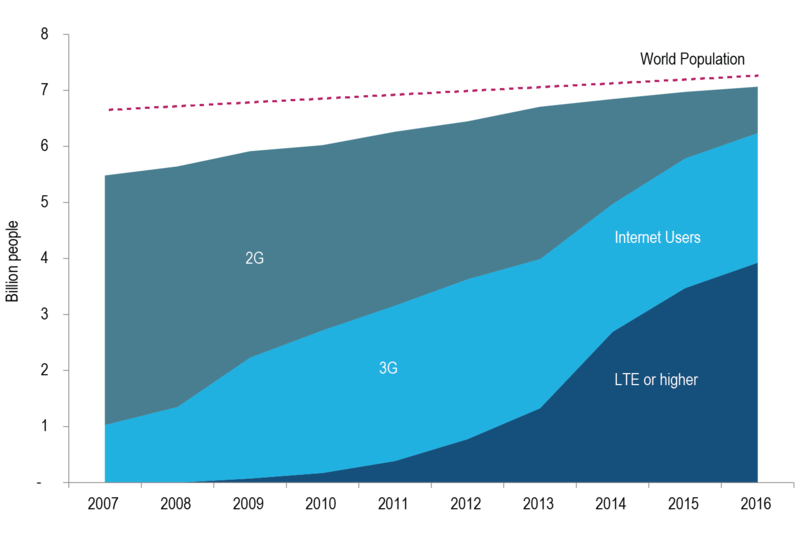 LTE and higher generation 4G technologies now account for over half of all global mobile subscribers. Speeds and coverage levels are increasing. For example, Vodafone Italy has announced the launch of 1Gbps mobile service in Rome, Naples and Palermo, and has begun 5G trials in Milan (16). In Singapore, the operators Singtel and StarHub have boosted mobile services to 1Gbps, following successful trials in 2017. Ooredoo Oman had covered 90% of the population with LTE network by mid-2018 (17). MTS Belarus has launched LTE services in 80 towns over the first half of 2018 to push out 4G to 70% of the population, including 95% of people in urban areas (18). Barely a decade on from the first launch of 4G, the first 5G trials have already started. As the industry heads towards the commercial introduction of 5G technology, investments in 5G-enabling and candidate technologies are growing. Several MENA operators have commenced trials of 5G and are beginning to map out spectrum strategies in conjunction with national regulatory authorities – for example, Zain and Etisalat have conducted 5G trials in Saudi Arabia, Kuwait and UAE. The first commercial deployments are likely in 2019, following approval of the international standards for 5G at WRC-2019. 5G deployments will ramp up significantly after 2020, and most developed economies should enjoy the benefits of 5G by 2023 – for example, China is predicted to have anywhere between 200 million (GSMA) or one billion (19) 5G users by 2023. Most other markets will still benefit from 4G networks, already available in 208 territories, according to the GSMA. Verizon Communications is already trialling fixed-wireless ‘5G’ residential broadband services in several markets in the US in 2018. Verizon had already trialled 5G residential applications in eleven markets in 2017 (20). Verizon plans a 5G trial for Sacramento, California, in late 2018, supported by millimetre wave (mmWave) spectrum. Ooredoo and Nokia are collaborating on 5G early trials starting in 2018 in Qatar, aiming to accelerate roll-out. Ooredoo considers that 5G innovation will help “deliver superior mobile data experiences for our customers. 5G will catalyze mobility, industrial networking, remote healthcare, virtual reality, and ultra-high-definition video, and enhance our customers’ digital experience and help them enjoy the Internet in new and exciting ways” (21). Viewpoint 3 emphasizes the importance of 5G, while Viewpoint 4 describes development of 5G in Saudi Arabia. Viewpoint 5 describes KT Corp’s GiGA Story Smart Village Project to boost regional economic growth in a province of the Rep. of Korea. as low as 2 milliseconds. Early 5G trials by StarHub and M1 have achieved transmission speeds of 35Gbps. To encourage greater innovation and facilitate 5G trials, Infocomm Media Development Authority (IMDA) waived frequency fees for 5G trials from May 2017 to end 2019. Commercial deployments should happen from 2020 onwards, and IMDA has engaged the public in shaping 5G spectrum requirements and regulatory provisions. In Europe, the EU 5G Action Plan targets an early market introduction for 5G in 2020 and a comprehensive roll-out up to 2025. Major opportunities for 5G in Europe lie in the digital transformation of major EU sectors (including automotive, manufacturing, energy, media and health sectors and other ‘verticals’). EU operators are ready for the launch of 5G around 2020, but in mid-2018, the operator Elisa launched an early 5G trial in Finland using Nokia network equipment and Huawei devices, including a “narrowband” IoT service. if not declining, ARPUs for many operators in a number of countries, where operators are seeing shifts in capitalization (as well as revenues, in some cases) to Over-The-Top (OTT) players. According to the World Bank’s forthcoming “Data-Driven Development” report, “telecom operators have developed several responses to OTT. They have argued for regulating OTTs that provide voice and text services in the same way they are. Some are developing their own OTT products. Others are including large bundles of their own offerings such as free calls or text in packages. Many are diversifying into opportunities in areas such as cloud computing, IoT and mobile money. Some are trying to do all of the above” (24). However, the World Bank acknowledges that OTT players “not only compete with telecom operators that provide video services, but are also responsible for [generating] a substantial portion of traffic going over the networks”. For example, a study of African mobile network operators by Research ICT Solutions showed that most operators have experienced strong revenue growth due to an OTT-induced increase in data demand, which generally outpaced declines in voice and SMS revenues (25). The German research institute WIK notes, “consumers do not use Rich Interactive Applications and communication services as like-for-like substitutes; more often than not, consumers use them complementarily” (26). In this scenario, operators’ broadband access infrastructure enables consumers to access online applications’ innovative content, which in turn drives consumer demand for operators’ broadband services. –A ‘lean-in strategy’ in which operators prioritize 5G investments with the hope of accelerating commercial prospects. –A more conservative approach, in which operators delay 5G investments as long as possible, while existing networks are upgraded. When network upgrades are no longer sufficient to support the increased traffic, operators will need to build new macro-sites or small cells to satisfy urban demand for capacity (28). McKinsey’s analysis suggests that many operators will embark on significant new build-out between 2020-2025. Some operators in the US are already in the process of decommissioning 2G, while a number of European operators are planning to shut down their 3G networks around 2020. 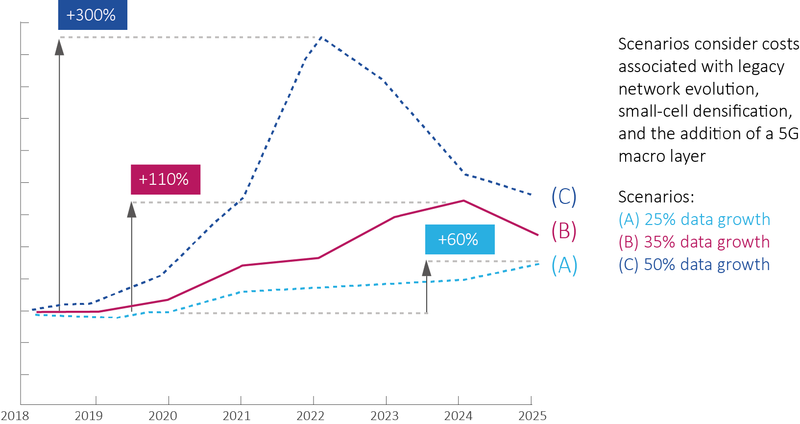 McKinsey foresees that Total Cost of Ownership (TCO) for mobile access networks will increase (Figure 5), although the increase will depend on data growth and industry circumstances. Others argue that 5G technology may prove less expensive per bit than previous generations. A range of players are investing in network infrastructure, including data centers, submarine cables, fibre networks, servers and routers to help deliver content to end-users, including operators, content and application providers. Despite this mobile success story, from the perspective of operators and other players in the industry, fibre-based backhaul is still vital for helping networks meet capacity and latency requirements for 5G, and supporting small-cell deployment in urban areas. In some countries, in recognition of their common interests, OTT players and telcos have partnered to expand broadband connectivity in previously underserved areas. For example, Facebook, Airtel, and BCS recently completed a 770 km fibre build in Uganda to provide backhaul to 3 million people and cross-border connectivity with neighboring countries. Note: Total Cost of Ownership (TCO) includes capex and opex for radio access network and transmission, but not core networks. Data are based on 3 operators in a European country; results are rounded. From the edge of cities to remote farms, there are millions of people worldwide who live in areas with few or no fibre or cable connections. Although their homes may have copper phone lines, they may live too far from the local telephone exchange for DSL connections to work well. If their homes are over a mile from a central office but within four miles from a LTE cell phone tower, mobile may still offer the fastest Internet service available. Deloitte (2018) suggests that this may be quite rare in the UK, France and other Western European countries, but it may be more common in other countries (29). In some countries, rural residents are more likely than urban residents to have mobile-only service (Figure 6). Smartphone penetration is also increasing in most markets. Deloitte predicts that, by the end of 2023, the penetration of smartphones among adults in developed countries will exceed 90%, up 5% on 2018, while smartphone sales will amount to USD 1.85 billion per year by 2023 (30). Smartphones offer improved performance due to 5G connectivity, higher transmission speeds, improved processors, additional sensors and AI chips, software and memory. Data traffic from smartphones surpassed voice traffic in 2009, and has grown since then at a tremendous rate. Close to 85% of mobile data traffic is generated by smartphones today, expected to reach 95% by end of 2023 (Ericsson, 2018). Approximately 40 million smartphones were sold in India in Q3 2017. With over 400 million Indians connected by 2G phones, India has passed the US to become the second-largest smartphone market and is even gaining in global share against China. With monthly service prices often under USD5 and many phones subsidized to USD25-35, Deloitte estimates 350 million more Indians will be connected by 2020 (31).